When the ground is on fire, you should not stop, drop, and roll. This wonderful spell for our beautiful Jaina played after the wily Arcane Artificer creates in most cases at least 15 differential in terms of armor gained and opponent attack removed. That's awesome for just 8 mana, and if studded with another Artificer that's 22+ differential for 9 mana. Or even less if supported prior by Emperor Thaurissan. What's better to run in constructed as late game spell: this or Firelands Portal? Depends on your list: a more control-ish playstyle would want flamestrike while tempo / face oriented mages would rather have Firelands Portal. One of the best AOE spell in the game. And probably the best one in a basic set. Do mech mages run Flamestrike? 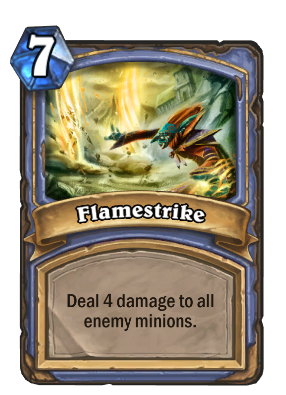 u do realize that freeze mage dont run flamestrike right? its a troll casting the spell........ all this time I never payed that close attention to the art work and thought it was a Naga caught in the flamestrike... yeah I feel stupid. Completely different class and context though. do you like nuke animation?